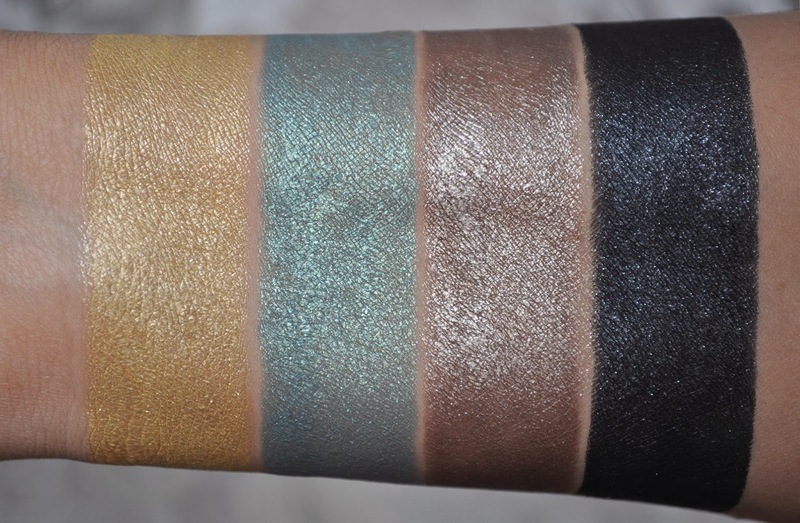 From left to right Stylo Fresh Effect Eyeshadows: 17 Cool Gold, 37 Jade Shore, 07 Moon River, 57 Black Stream. 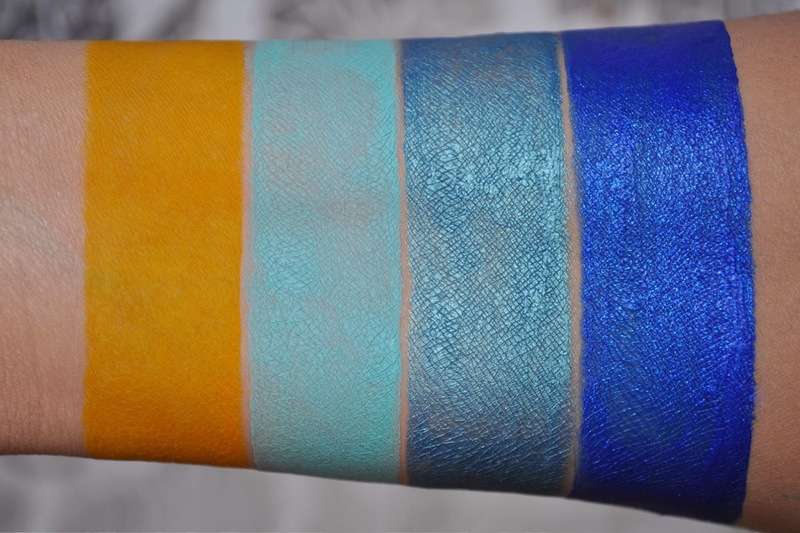 From left to right Inimitable Waterproof Mascara: 27 Zest, 37 Lime Light, 47 Aqua Blue, 57 Blue Note. I'm over the moon in love with the Zest mascara! It dries down to a gorgeous egg yolk yellow that carries beautifully into Autumn. Chanel Soleil Tan De Chanel Luminous Bronzing Powder in 917 Sable Rose. Chanel Joues Contraste Blush in 70 Tumulte (on the apples). Chanel Stylo Fresh Effect Eyeshadows in 07 Moon River (blended on the lid). Chanel Stylo Yeux Waterproof Long-Lasting Eyeliner in 35 Gris (on the upper lashline, used to tightline, and the lower lashline). Chanel Inimitable Waterproof Mascara Multi-Dimensional in 47 Aqua Blue (lower lashes). Chanel Rouge Coco in 13 Gardenia. Chanel Levres Scintillantes Glossimer in 267 Pink Peony. Chanel Joues Contraste Blush in 71 Malice (on the apples). Chanel Stylo Fresh Effect Eyeshadows in (blended on the lid). Chanel Soleil Tan De Chanel Luminous Bronzing Powder in 907 Sable Beige (in the crease). Chanel Stylo Yeux Waterproof Long-Lasting Eyeliner in 50 Jade (on the upper lashline and the lower lashline). Chanel Inimitable Waterproof Mascara Multi-Dimensional in 37 Lime Light (lower lashes). Chanel Rouge Coco in 76 Sari Dore. Chanel Levres Scintillantes Glossimer in 277 Pensee. Chanel Soleil Tan De Chanel 4 Facettes Bronzing Powder in 537 Bronze Corail (all four shades mixed together and applied as bronzer). Chanel Soleil Tan De Chanel 4 Facettes Bronzing Powder in 537 Bronze Corail (the coral shade applied to the apples). Chanel Stylo Fresh Effect Eyeshadows in 17 Cool Gold (blended on the lid). Chanel Soleil Tan De Chanel 4 Facettes Bronzing Powder in 537 Bronze Corail (mix the first three shades and blend into the crease). Make Up For Ever Aqua Eyes Waterproof Eyeliner Pencil in Gypsy (the upper lashline, used to tightline, and the waterline). 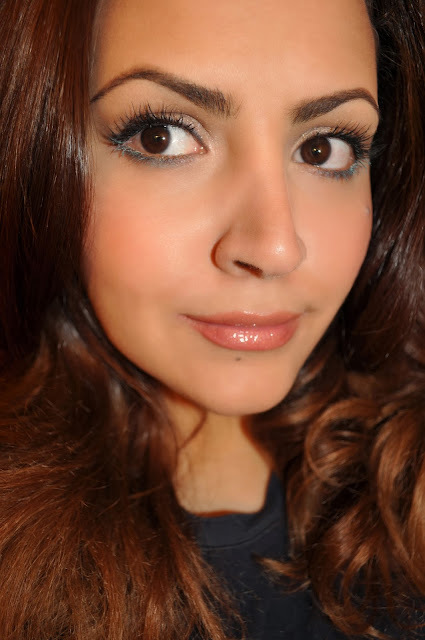 Chanel Inimitable Waterproof Mascara Multi-Dimensional in 57 Blue Note (lower lashes). Chanel Rouge Coco Shine in 447 En Vogue. Chanel Levres Scintillantes Glossimer in 337 Calypso. Chanel Soleil Tan De Chanel 4 Facettes Bronzing Powder in 547 Bronze Rose (all four shades mixed together and applied as bronzer). Chanel Soleil Tan De Chanel 4 Facettes Bronzing Powder in 547 Bronze Rose (the pink shade applied to the apples). Chanel Joues Contraste Blush in 70 Tumulte (layered over the pink blush of 547 Bronze Rose). 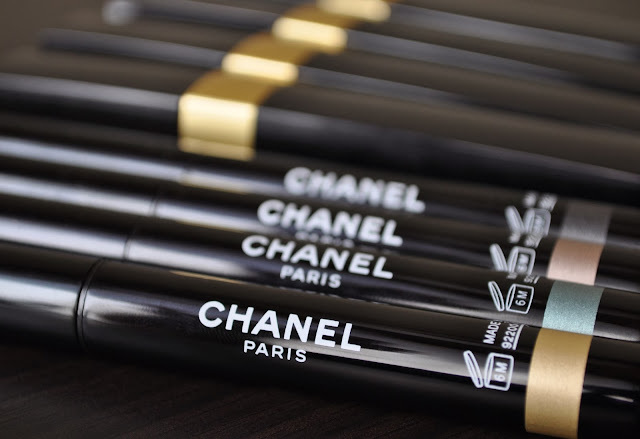 Chanel Stylo Fresh Effect Eyeshadows in 57 Black Stream (blended on the lid). Chanel Soleil Tan De Chanel 4 Facettes Bronzing Powder in 547 Bronze Rose (mix the first three shades and blend into the crease). Chanel Inimitable Waterproof Mascara Multi-Dimensional in 27 Zest (lower lashes). Chanel Rouge Coco in 78 Peregrina. Chanel Levres Scintillantes Glossimer in 407 Laser. What Summer Collections are you carrying into Fall? I love Zest to much, that I got a backup. Maybe you should give it another go?! All these looks are so beautiful, a feast for our eyes Liz! I really like 2 and 3. You wear colour so beautifully! Love the look of lime light and jade together, but adore your overall look in the last look! I love the colored mascaras on your beautiful lashes!! We're always on the same wavelength when it comes to makeup taste. The fourth look was my favorite, the third placing second, and so on. I love all the looks! I regretted I didn't purchase Moon River, it looks like such a versatile shade. I'm still wearing bronzer a bit left over from summer, that's about it. I cannot wait to jump into Fall with deep colors! Maybe you can find Moon River online some where? I know how you feel, it's still too hot and humid here to get into the rich autumnal colors. wow! I love the Jade look. New member here. I came across your blog because I was searching for Inglot swatches. You have some great pictures and swatches! great blog! What Inglot shades are you interested in? Thank you for the sweet compliments, and I hope you continue to enjoy the blog.